Today I am so happy to announce my involvement with this year’s ARISE Music Festival! 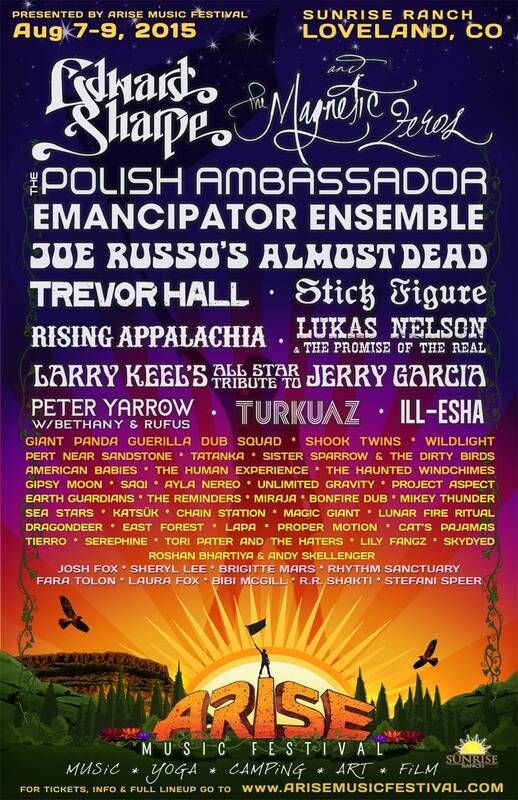 Arise is a fantastic 3 day music, yoga, arts, and camping festival held at Sunrise Ranch. Sunrise Ranch is one of the most majestic spiritual retreat and conference centers in all of Colorado. This year will be the third annual Arise festival and I have been blessed this year with the opportunity to manage the Arise Festival Internship program! We have recently announced wave 1 of our initial lineup featuring Edward Sharpe and the Magnetic Zeros, The Polish Ambassador, Emancipator Ensemble, Joe Russo’s Almost Dead, Rising Appalachia Music, Trevor Hall, Lukas Nelson & Promise Of The Real & MANY MORE! More music, yoga, workshops and of course all of our incredible participating artists to be announced soon! !